WINNIPEG — With standout performances at the 10th annual Bison Classic this past weekend, Madisson Lawrence and Markus Rurangirwa from Bison track and field have been named the Boston Pizza Bison Sports Athletes of the Week for the week ending February 5, 2019. The Bison track and field teams hosted the 10th annual Bison Classic this weekend, earning a combined win (257.5 points). For the No. 10 ranked women's team, a standout performance came on both the field and the track from second-year heptathlete Madisson Lawrence. Lawrence had three top-four finishes at the meet, led by a second-place finish in the 60m hurdles in a time of 8.69 seconds. She also finished third in the high jump at 1.61 metres and fourth in the long jump at 5.20 metres. As of this week, the Winnipeg native is in the Canada West top ten in three events: 60m hurdles (8th, 8.84 seconds); high jump (6th; 1.66m); and pentathlon (5th; 3,408 points). These marks have her nationally ranked at 12th in high jump and 11th in the pentathlon. 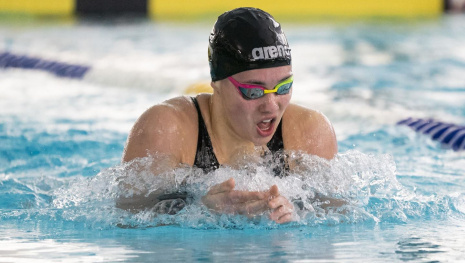 Lawrence, a student in the Faculty of Science, will now try to improve her marks ahead of earning a roster spot for the 2019 Canada West Track & Field Championships, taking place February 22-23 at the University of Alberta. The University of Manitoba then hosts the U SPORTS Track & Field Championships from March 7-9, 2019. Also performing well at the 10th annual Bison Classic at James Daly Fieldhouse was first-year jumper Markus Rurangirwa. The Winnipeg native put together a great performance in his signature event, the men's triple jump, improving a previous season-best of 14.03 metres all the way up to 14.48 metres. It earned him second place in the event but first among university athletes — Bisons alum Gee-ef Nkwonta won the event as a club athlete. The 14.48m mark jumps him all the way into the top three for U SPORTS, behind only Denzel Brown of Trinity Western (14.51m) and Femi Akinduro of Toronto (14.64m). Rurangirwa, a student in University 1, is also conference-ranked in the men's high jump with a season's best of 1.93m. He too will look to improve his marks ahead of the Canada West Championships and the U SPORTS Championships at the U of M.
The Bison track and field teams compete at the South Dakota State University Invitational this weekend (February 8-9) before hosting their Bison Grand Prix #2 on Wednesday, February 13 at the James Daly Fieldhouse.